Stage, Sherrie Wolf's latest exhibition continues to explore her interest in the magic of illusion. As she explains, "I aim both to exploit and to reveal, rather than disguise, the fact that art is artifice. My process is like designing a theatrical production in which I set the stage, choose the characters and determine their gestures. I am drawn to complex layers of activity, and to both compositional and conceptual interactions." The work in this show presents a broad range of perspectives and juxtapositions. Viewers will see still life imagery cascading across lush drapery, interspersed with multiple postcard references to art history, in contrast with more formally staged floral still life set against single image references to Sargent, Lorraine, or Vernet. Wolf also continues to pursue her interest in self portraiture, restaging herself in the role of Velasquez from his painting Las Meninas. In addition to her paintings, Wolf presents a recent suite of photogravure etchings. 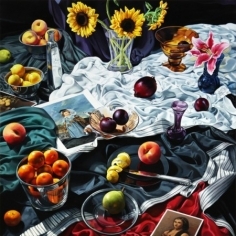 Sherrie Wolf graduated from the Museum Art School, now the Pacific Northwest College of Art, Portland, OR, in 1974 and received an MA from the Chelsea College of Art in London, England in 1975. She began exhibiting her work in the mid 1970s while teaching art at PNCA. Her work is included in such collections as The Vivian and Gordon Gilkey Center for Graphic Arts, Portland Art Museum; Hallie Ford Museum, Salem, OR; the Tacoma Art Museum, Washington; City of Seattle; and Washington State Art Collection. Wolf has also been included in multiple curated group exhibitions across the country. In recent years Wolf’s work has been featured in solo exhibitions at Northern Arizona University in Flagstaff and at the Long Beach Museum of Art in Southern California. 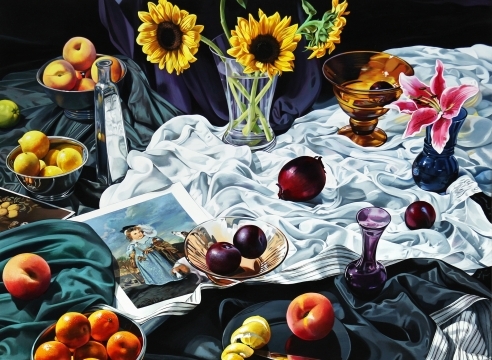 In 2015 the Hallie Ford Museum of Art, Willamette University, Salem, OR, featured Wolf's prints and paintings in Object Lessons, simultaneous with her inclusion in their curated group exhibition Stilleven: Contemporary Still Life.